Christmas stocking has a snowman with winter scene snowflake and snow tree applique on the red velveteen body of the stocking. The snowman wears an applique hat and and red knit scarf with fringe around his neck. 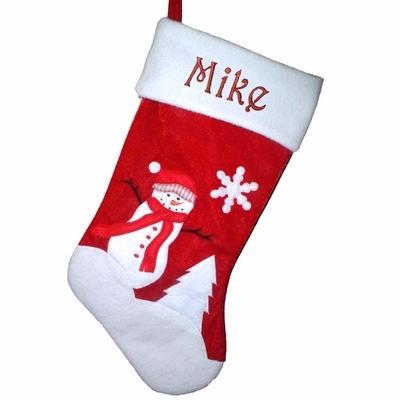 Names can be personalized on the cuff of this Christmas stocking with metallic embroidery thread to compliment the appliqu� design.